The trackbed starts turning north-east and 400 yards on we pass two abandoned semi-detached stone-built cottages with gates leading directly to the trackbed (photo below left). These were apparently built at the same time as the railway and might have been for railway workers, though there is no record of what their job was. The nearest signal box, which survived until the 1920s, was some way to the west. We weighed up the pros and cons of living in such a remote location, but other than the railway track itself there is no access at all. Even the railway bridge close by to the cottages has no signs of a track over it but then much time has passed. A little further on there is a large limestone quarry to the left of the trackbed, though it is separated from the railway behind a rock wall. Then there are two lime-kilns. Lime was produced on site by burning the limestone from the quarry in the kilns and a railway siding in front of the kilns allowed the lime to be carried away by rail. Even today, so long after the track was lifted the pattern made by the sleepers can still be seen. Perhaps the boarded-up house was for quarry workers. Whilst lime had been used on arable crops from the end of the 18th century to reduce the acidity of soil, the lime produced here was used in steel making in Barrow and Darlington at either end of the railway line. But the quality of the lime was not good enough and the kilns stopped working by the end of the century. The trackbed moves away from the valley side and the reason for this is quickly apparent. We walk onto a spectacular railway viaduct that crosses the valley from one side to the other at a shallow angle. 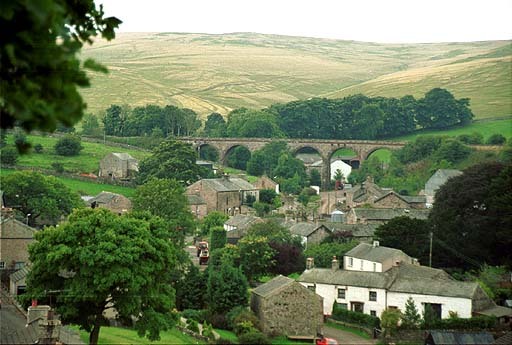 The Smardale Gill viaduct is 90ft high and 553ft long, and it crosses Scandal Beck on fourteen semi-circular arches. The viaduct was designed by Sir Thomas Bouch for the South Durham and Lancashire Union Railway (SD&LUR) and was constructed by a Preston-based contractor Mr Wrigg. It cost £11,928 and was opened in August 1861. The viaduct is built of dressed rough-hewn sandstone blocks, and was wide enough to carry two tracks, but only one track was laid between Kirkby Stephen to the east and Sandy Bank to the west possibly to ease the curves of the line for the trains. Read more about the SD&LUR at the end. After the line closed in 1962 the viaduct fell into disrepair and by the 1980s the structure had become dangerous and was to be demolished. Instead the viaduct became a listed building, and a charitable trust, the Northern Viaduct Trust was formed in 1989 to take on the task of the viaduct’s restoration. British Rail offered £230,000 (the estimated cost of demolition) towards its restoration, which was completed in 1990. The Northern Viaduct Trust has also restored two other stone viaducts further east at Merrygill and Podgill. At the end of the viaduct the trackbed slowly curves north and passes through Smardale Gill nature reserve (photo above right), a National Nature Reserve and Site of Special Scientific Interest, which is owned and owned by Cumbria Wildlife Trust. It includes rich limestone grasslands on the cuttings and embankments, the ancient semi-natural Demesne Wood, river habitats and a rich diversity of flowers, butterflies, birds and small mammals. The reserve also extends west beyond the viaduct, the way we had come, and encompasses both sides of the valley and the lime kilns and quarry. It is drizzling on and off but the richness of the reserve either side of the trackbed is beautiful. As the trackbed turns north-east, it passes under another viaduct. This I realise carries the Settle and Carlisle Railway. After a couple of minutes, a train rushes over it, though the train can’t be seen as we are underneath, and anyway the trees hide most of the structure, which is the highest on the line. This is Smardale Viaduct, and a bit further north it goes through our starting point at Crosby Garrett. As I stroll along, a small patch of the surfaced path gives way and my foot falls into a hole. I fall forward, unhurt but a little shaken. Patrick is some way ahead. As I get up I see this weather-worn notice on the side of the path (photo above right) saying that this was the site of the Smardale train derailment on 20 May 1955. Quite a coincidence. I catch up with Patrick at the wildlife reserve notice board where the footpath through Smardale Gill comes to an end. The minor road back to Crosby Garrett is close by, as is Smardale Hall. The original hall dates from the 14th century and the current building has been much altered and is unusual in having four conically roofed round towers at the corners giving the hall an appearance similar to the Scottish baronial style of architecture. Crosby Garrett is just over a mile away but as we turned a corner we were stopped by the heavy flow of Scandal Beck over a ford. Fortunately, there was a wooden footbridge off to the side so we able to cross over, but several cars came down the road from Smardale, braked suddenly and had to turn around. Our walk was just under 6 miles long, the total ascent was 935 feet, and it took us, with many stops, about five hours. The walk was slightly adapted from the walk in the Cicerone Guide Walking in Cumbria’s Eden Valley. Four miles south-east of Drybeck Hall is Great Asby Scar, a National Nature Reserve that has some of the finest examples of limestone pavement in Britain and a taste of upland wilderness. It forms part of the vast limestone outcrop of the Shap and Orton Fells. Our starting point for this anti-clockwise walk was a lay-by adjacent to a farm track called Knott Lane on the minor road that runs from the village of Orton in the west and over the moors east to Raisbeck. Knott Lane gets its name from The Knott, the highest point on the scar at 1,350 feet. After a few hundred yards up the track, Wainwright’s Coast to Coast Walk that comes from Orton crosses the track heading for Sunbiggin Farm, and we follow it across several fields, over stiles, carefully avoiding some cows on the way, onto a narrow road leading up to the farm. Beyond the farm (photo left), it’s a gentle climb north-east between drystone walls, eventually coming out into the open limestone country and rocky outcrops of Great Asby Scar at the highest point of the walk at 1,200 feet. The long line of the northern Pennines could be seen in the distance. 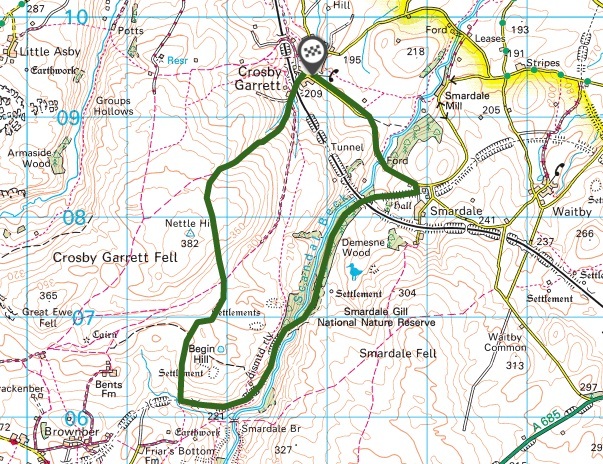 It’s a fairly straight walk on indistinct paths down the other side of the scar until you reach the vehicle track from the west which goes east to some quite remote farms at Maisongill, Asby Grange, and Grange Hall. While tucked out of the wind behind a drystone wall having our lunch, two environmental rangers who were passing by stop for a chat. They work for Defra and one of them is responsible for a huge area locally. They had some good stories about having to be diplomatic as well as tough with some of the local farmers. 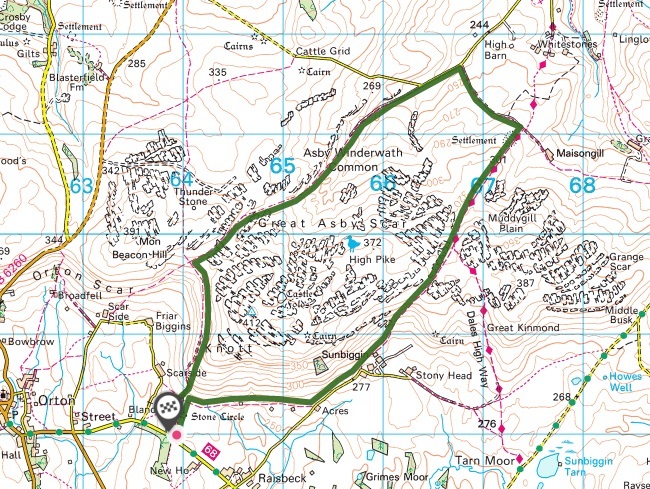 We walked west away from the farms (photo above right), then left onto a minor road coming right from Great Asby, and then shortly after up a track known as Copper Mine Lane which goes back up towards Great Asby Scar and the nature reserve. In the reserve, a distinct winding path leads us south-west through a fascinating limestone landscape. The deep fissures, or grikes, of the rock pavement are caused by weathering, and these divide the pavement into blocks called clints. Great Asby Scar is home to a great diversity of birds, as well as many rare plants which grow in the limestone fissures. Grazing has been stopped in the reserve to allow dwarf trees to grow on the pavement and deep heather to re-establish. At the southern gate out of the reserve there are good views of the eastern Lake District to the west, and the Howgill Fells to the south. 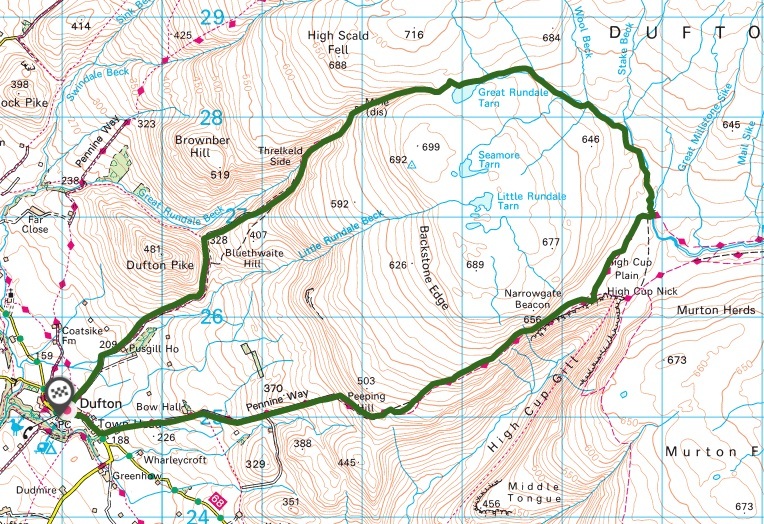 A bit further on, we turned left at a figure post, and a track took us south-east along the side of the scar and then back down to our starting point. The wind started to blow heavily and it got quite cold. The walk was 7 miles long, the total ascent was 870 feet, and it took us, with one longish stop, about four hours. The walk was again slightly adapted from the walk in the Cicerone Guide Walking in Cumbria’s Eden Valley. The South Durham and Lancashire Union Railway ran through sparsely populated countryside over difficult terrain from Bishop Auckland in the east to Tebay in the west, via Barnard Castle, Stainmore Summit and Kirkby Stephen. The line was built to take coke from the Durham coalfield to fuel the blast furnaces in Barrow in Furness and west Cumberland, and to take iron ore back to Cleveland. The 35-mile section between Barnard Castle and Tebay, which opened in 1861, became known as the Stainmore Line. This is the route of the SD&LUR. The highest point, Stainmore Summit, is between Barras and Bowes stations right of Kirky Stephen. Smardale Gill is between Ravenstonegill and Kirky Stephen on the left. Thomas Bouch was the designer for the Stainmore line. The SD&LUR Board had limited capital and Bouch needed to engineer the route frugally. Earthworks were kept to a minimum, and tunnels were avoided, but at the cost of severe gradients over gruelling stretches on either side of Stainmore Summit, the highest railway summit in England at one time at 1,370 ft. The replica sign on the left marks the desolate Stainmore Summit. Trains sometimes became snowbound in winter and had to be dug out by railway workers using shovels and snowploughs. Here is a British Transport Film of just such a rescue in 1955, Snowdrift at Bleath Gill. The location is just north of Barras station and near Stainmore Summit. The line generally followed the contours of the land but there were several places where it was not possible to avoid crossing valleys. In the end twelve viaducts needed to be built. Three of the viaducts, at Tees, Deepdale, and Belah viaducts west of Kirkby Stephen used braced wrought iron, on stone bases, and as Bouch had no experience of this kind of iron construction, he relied on the civil engineer Robert Henry Bow. Belah viaduct is on the left, Deepdale viaduct is on the right. Sadly, Thomas Bouch died a broken man when the Tay Bridge, which he also designed, was blown down during a violent storm in 1879 as a train passed over it with great loss of life. At the end of the 19th century the line was used by twenty freight trains and five passenger trains a day, though the line always struggled to attract passengers. By 1947 there were only two passenger trains a day on the Stainmore line. The 12-mile journey from Kirkby Stephen to Tebay took 25 minutes. Local passenger trains were withdrawn between Kirkby Stephen and Tebay in 1952, but freight services continued to use the line. The line was still a popular route however for steam-hauled summer services on Saturdays, often made up of antiquated stock, from the north-east to Blackpool which continued until the end of the 1961 holiday season. Two old photos of steam-hauled freight trains in Smardale Gill where we walked, possibly from the late 1920s/early 1930s (© Eddie Foster). On the left, the train has left Smardale Gill Viaduct and is heading towards the lime kilns. In the photo on the right, the train is passing the cottages, which looked occupied. Against considerable local and regional opposition, the Minister of Transport, Ernest Marples, eventually authorised abandonment of the line in December 1961 and it closed on 20 January 1962 (this was before the Beeching report of 1963). This was one hundred and one years since the line was opened, and a year before the ironworks at Barrow finally shut in face of increasing competition from British and foreign steelworks. At that time few seem to have found it strange that the government minister responsible for signing the legal orders to close railway lines was a man whose wife was a major shareholder in a company he had founded (Marples-Ridgeway) that was making large profits out of the construction of new roads often along the routes of former railway lines. The underlying malaise that led to the closing of the line here was the unimaginative management of Britain’s railways. Nothing meaningful was attempted in respect of building traffic on the line. Operating costs could have been cut dramatically. 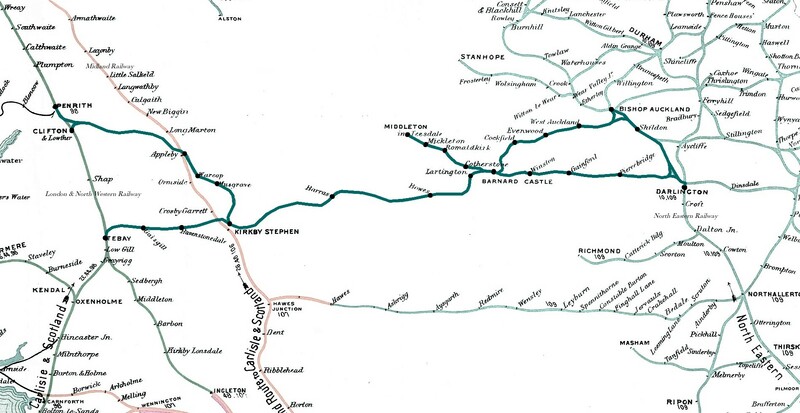 If the line had been managed as part of a simplified cross-country network connecting Newcastle and Durham with Manchester and the Lake District, it could have survived as a useful and profitable link in a modernised system. It is no accident that many who were involved in objecting to the Stainmore closure went on to fight and win the later campaign to avoid closure of the Settle-Carlisle route in the 1980s. The lifting of the track between Barnard Castle and Tebay began almost immediately. Within a year of closure, the magnificent iron viaducts at Belah, which was 196 feet high and 1,040 feet long, and at Deepdale, were demolished. The part iron, part stone Tees viaduct was demolished in 1971. On the left is a photo of the demolition of Belah Viaduct in 1963 (© Northern Viaduct Trust), one year after the railway line was closed. The photo on the right is of all that remains: two stone buttresses on opposite sides of the Belah Valley. The destruction of those unique Victorian iron viaducts to realise a few thousand pounds in scrap value has been described as an unforgivable act of institutional vandalism. In the early 1960s there appeared to be no institutional understanding at all of the potential value of British industrial heritage. Belah and Deepdale viaducts was destroyed just eighteen months after the demolition of the Euston Arch in London, an act of Philistinism which began to mobilise opinion in favour of conserving historic structures.